Cassadee Blake Pope (born August 28, 1989) is an American singer, songwriter, and musician. 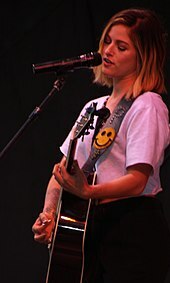 Pope was the lead vocalist of the rock band Hey Monday (on hiatus as of December 2011), with whom she released one studio album and three EPs. Pope embarked on a solo career in early 2012, and released Cassadee Pope (EP) in May 2012. She took part in the third season of The Voice and became the first female winner on December 18, 2012. Her debut solo country album, Frame by Frame, was released on October 8, 2013 to a top 10 Billboard 200 charting. It debuted at No. 1 on Top Country Albums, with 43,000 copies sold in its first week. While attending Wellington High School in Wellington, Florida, Pope formed the band Blake with good friend Mike Gentile. The project disbanded before being signed and in 2008, she and Gentile along with Alex Lipshaw, Michael "Jersey" Moriarty, and Elliot James founded the pop punk band Hey Monday. Hey Monday released their first studio album, Hold on Tight, in October 2008. Pope wrote two songs and co-wrote the other nine songs. She appeared in Fall Out Boy's video for "America's Suitehearts", from their 2008 album Folie à Deux. She also provided guest vocals for The Cab's remix version of their song "Take My Hand" that appeared on Fall Out Boy's mixtape, Welcome to the New Administration, and appeared in the music video for it the following summer of 2009. James left the band at the end of 2009. Hey Monday's first EP Beneath It All was to be released in August 2010; to promote the album the group toured the US and played on the 2010 Warped Tour. The Christmas EP was released on December 6, 2011, and later that month Hey Monday took an indefinite hiatus on good terms. In January and February 2012, Pope embarked on her first solo acoustic tour across the east and west coasts of the United States. She released her debut self-titled EP (self-labeled) on May 22, 2012, containing four songs written by Pope. She auditioned for season 3 of the singing competition The Voice during the summer and had all four coaches offer her a place on their teams; she ultimately picked country singer Blake Shelton. In the third live round, Pope performed "Over You", co-written by mentor Shelton. The song reached number one on the iTunes chart, knocking Psy's "Gangnam Style" down to number two. She was the only female contestant to advance to the Top 4 round where she performed "Stupid Boy" by country singer-songwriter Sarah Buxton, which also reached number one on iTunes. She advanced to The Voice finals, winning the title on the live finale results day in December. An album compiling her performances on The Voice entitled The Voice: The Complete Season 3 Collection reached No. 1 on the Heatseekers and sold 11,000 copies, and 8,000 more copies in the following week. Her self-titled EP also re-entered the chart at No. 42, selling 1,000 copies. In January 2013, Pope signed with country music label Republic Nashville; the lead single of her solo album, "Wasting All These Tears", was released on May 31, 2013. It debuted at number 37 on the Billboard Hot 100 and number 7 on the Billboard Hot Country Songs chart. It sold 125,000 copies in first week of release. The album, Frame by Frame, was released in October 2013. Pope spent most of 2014 touring with country artists Tim McGraw and Dierks Bentley. She also was featured on the Nashville Outlaws: A Tribute to Mötley Crüe album where she covered The Animal In Me. Pope released the lead single, "I Am Invincible" from her upcoming second studio album. During late 2015, Pope recorded a duet with Chris Young, titled "Think of You" for his 2015 album I'm Comin' Over. This single became Pope's first song to peak at number one on the US Country Airplay chart in May 2016. In March 2017, Pope travelled to London and performed several times as part of the C2C: Country to Country festival line-up, including an appearance on the main stage with Young. Pope's new EP, Summer, was released on June 3, 2016 and the title track was released as a single on June 6, 2016. On July 24, 2016, Pope sang the Star Spangled Banner, the United States national anthem, before the Brickyard 400 NASCAR race at the Indianapolis Motor Speedway. On October 16, 2016, Pope sang the Star Spangled Banner, the United States national anthem, before the Houston Texans and Colts game. Pope and her duet partner Chris Young were nominated for Best Country Duo/Group Performance for their hit song "Think of You", making her first contestant from The Voice to receive a Grammy nomination. On March 30, 2018 she independently released her first single in nearly 2 years, called “Take You Home”. It was followed on August 10 by her second single of 2018, called “One More Red Light”. On February 1, 2019, Pope released her second full-length studio album, Stages. In 2010, Pope began dating drummer Rian Dawson, who is a member of the band All Time Low. They became engaged in February 2017. In July 2017, it was announced that the couple had ended their relationship. As of December 2017, Pope has been in a relationship with British actor and musician Sam Palladio. When it comes to Pope's influences she has said “I’m all over the place. I tend to go backwards a little bit and listen to Natalie Imbruglia's Left of the Middle and old Shania, Michelle Branch, Avril, Blink 182…I’m kind of all over the board. And then more recently I’m into the new Blake Shelton album, not gonna lie. Hunter Hayes and Taylor Swift.” Pope also mentions Martina McBride as one of her influences. 2010 Hellcats Episode: "Nobody Loves Me But My Mother"
2016 Lip Sync Battle Episode: "Cassadee Pope vs. Dustin Lynch"
2017 Nashville Episode: "'Til I Can Make It on My Own"
"—" denotes a recording that failed to chart or was ineligible for that chart. "—" denotes items which failed to chart. "I Wish I Could Break Your Heart"
"—" denotes items which failed to chart or was not released to that territory. ^ Stages did not enter the Billboard 200, but did chart at number 81 on the Top Album Sales component chart that tracks physical and digital albums sales. ^ "Over You – Cassadee Pope: Songs, Reviews, Credits, Awards". AllMusic. Retrieved 24 May 2013. ^ a b Sam Lansky (May 20, 2013). "Cassadee Pope's "Wasting All These Tears": Hear Her (Amazing) New Single". Idolator.com. Retrieved May 24, 2013. ^ Kara Warner (December 19, 2012). "Cassadee Pope: Before She Was 'The Voice' – Music, Celebrity, Artist News". MTV. Retrieved May 24, 2013. ^ "Hey Monday Bio". AllMusic. ^ Jessen, Wade (Oct 26, 2013). "Pope, Rogers Debut". ProQues. Retrieved Feb 14, 2016. ^ Hey Monday Announce Hiatus Archived 2013-10-04 at the Wayback Machine Livemusicguide.com. Retrieved January 10, 2012. ^ Hey Monday Guitarist Releases Statement Regarding Hiatus Alter The Press. Retrieved January 10, 2012. ^ Don't Panic (2012-05-22). "Cassadee Pope – EP: Album Review". idobi. Retrieved 2012-12-20. ^ Caulfield, Keith (December 27, 2012). "'Voice' Winner Cassadee Pope Debuts at No. 1 on Heatseekers Albums Chart". Billboard. Retrieved 28 December 2012. ^ a b c "Cassadee Pope Chart History – Hot 100". Billboard. Retrieved April 3, 2018. ^ Thompson, Gayle (August 9, 2013). "Cassadee Pope Documentary Series Premiering in October". The Boot. Retrieved August 11, 2013. ^ "Mötley Crüe, Various – Nashville Outlaws (A Tribute To Mötley Crüe)". Discogs. Retrieved 2015-11-09. ^ Kimble, Lindsay (February 1, 2017). "Cassadee Pope Is Engaged to All Time Low Drummer Rian Dawson — See Her Ring!". People. Retrieved 6 October 2018. ^ Chiu, Melody (July 12, 2017). "Cassadee Pope and Rian Dawson End Their Engagement". People. Retrieved 6 October 2018. ^ Mizoguchi, Karen (March 29, 2018). "Cassadee Pope Talks 'Super Easy Breezy' Romance with Sam Palladio — and Their Paw-fect First Date". People. Retrieved 6 October 2018. ^ Harr, Dan (July 1, 2013). "Cassadee Pope Enjoying Broad Base Of Musical Influences". Music News Nashville. Retrieved 12 March 2014. ^ a b "Cassadee Pope Chart History – Country Albums". Billboard. Retrieved April 3, 2018. ^ a b c "Cassadee Pope Chart History – Billboard 200". Billboard. Retrieved April 3, 2018. ^ "Cassadee Pope Chart History – Independent Albums". Billboard. Retrieved February 12, 2019. ^ "Cassadee Pope Chart History – Canadian Albums". Billboard. Retrieved April 3, 2018. ^ "2014-05-31 Top 40 Country Artist Albums Archive". Official Charts Company. Retrieved 5 June 2014. ^ "Cassadee Pope Chart History – Top Album Sales". Billboard. Retrieved April 3, 2018. ^ Bjorke, Matt (February 20, 2019). "Top 10 Country Albums Chart: February 20, 2019". Roughstock. Retrieved March 1, 2019. ^ a b "Cassadee Pope Chart History – Heatseekers Albums". Billboard. Retrieved April 3, 2018. ^ a b c "Cassadee Pope Chart History – Hot Country Songs". Billboard. Retrieved April 3, 2018. ^ "Cassadee Pope Chart History – Country Airplay". Billboard. Retrieved April 3, 2018. ^ "Cassadee Pope Chart History – Canada Country". Billboard. Retrieved April 3, 2018. ^ a b "Cassadee Pope Chart History – Canadian Hot 100". Billboard. Retrieved April 3, 2018. ^ Matt Bjorke (March 26, 2014). "Country Chart News – The Top 30 Digital Singles – March 26, 2014: Florida Georgia Line #1, Luke Bryan, Dan+Shay, Jerrod Niemann, and Scotty McCreery Notables This Week". Roughstock. Archived from the original on March 27, 2014. ^ "American single certifications – Cassadee Pope – Wasting All These Tears". Recording Industry Association of America. If necessary, click Advanced, then click Format, then select Single, then click SEARCH. ^ Matt Bjorke (July 30, 2014). "The Top 30 Digital Singles – July 30, 2014". Roughstock. Archived from the original on 2014-10-06. ^ http://www.roughstock.com, Roughstock -. "The Top 30 Digital Singles: December 14, 2015 | RoughStock". RoughStock. Retrieved 2016-03-30. ^ "American single certifications – Chris Young – Think Of You". Recording Industry Association of America. If necessary, click Advanced, then click Format, then select Single, then click SEARCH. ^ "Canadian single certifications – Chris Young – Think Of You". Music Canada. ^ "Single Releases : MusicRow". MusicRow. Archived from the original on August 2, 2018. Retrieved August 2, 2018. ^ "Cassadee Pope - If My Heart Had a Heart". Daily Play MPE. Retrieved February 5, 2019. ^ "Champagne – Single by Cassadee Pope". iTunes Store (New Zealand). Apple Inc. Retrieved 27 July 2015. ^ Conaway, Alanna (July 17, 2013). "Cassadee Pope Debuts "Wasting All These Tears" Music Video". Roughstock. Archived from the original on 2013-09-28. Retrieved July 18, 2013. ^ "CMT : Videos : Cassadee Pope : I Am Invincible". Country Music Television. Retrieved September 26, 2015. ^ "Think of You (Duet with Cassadee Pope) – Chris Young". Vevo. Retrieved January 22, 2016. ^ Scott, Jason (June 3, 2016). "Watch: Cassadee Pope recalls a burning love in 'Summer' music video". AXS. Retrieved June 4, 2016. ^ Highfill, Samantha (June 20, 2013). "Will 'The Voice' ever find a Kelly Clarkson or Carrie Underwood?". EW.com. Retrieved June 14, 2013. Wikimedia Commons has media related to Cassadee Pope. "How You Love Me Now"
This page was last edited on 14 April 2019, at 05:09 (UTC).